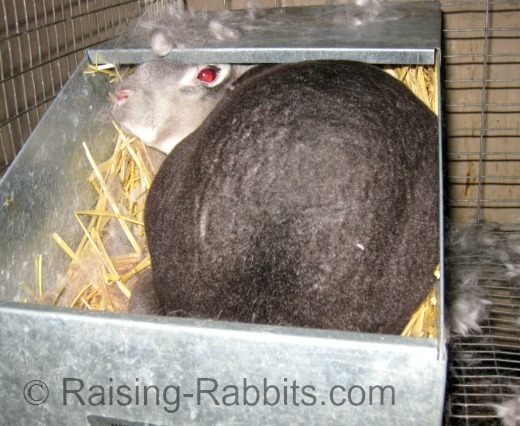 Part of rabbit breeding is taking care of the pregnant doe from conception to kindling. And it sure doesn’t take long - 31 days, once rabbit mating has happened. You’ll want to know all the important rabbit-breeding milestones the doe will cross as she progresses toward giving birth just 31 days later. Keep good records! You'll avoid accidentally missing an important step, like getting a nest box into the doe’s cage on time. If you forget which day you bred the doe, you might wake up one morning and find your precious newborn kits scattered across the cage floor, cold as popsicles. Thirty-one days can pass in a flash, if you get distracted! Up until palpation, you will treat the doe as always. Especially--no extra feed. This is important, because you don’t want her to get fat, should she not actually be pregnant. But later, if you conclusively determine from palpation that she has kits growing inside her, or, if she’s gained a pound although you’ve given her no extra feed (a good sign she may indeed be pregnant), then start increasing the amount you feed her, little by little. But not until after Day 14 or a positive palpation. Palpate the doe’s belly between day 10 and day 14 after conception. A positive palpation will reveal soft, grape-sized lumps along both sides of the abdomen. Only then can you be truly sure that the rabbit breeding resulted in a pregnancy. See our Pregnant Rabbit page for several other ways to tell if your doe is pregnant. By the time the doe reaches 3 weeks pregnant, she's pretty much free-fed. She may start feeling the increased abdominal pressure from the growing kits, and may not appear to be eating as much, which is fine. I know some breeders don’t increase feed, ever, but for my rabbits, I feel better knowing there’s a few extra pellets in the feeder, just in case. Between Days 21 and 28 is when you'll start noticing strong nesting tendencies--scratching at the cage floor and carrying straw in the mouth. Put the nest box in the doe’s cage. Don’t put it on top of her ‘toilet.’ At what spot under her cage do most of her droppings fall? Put the nest box somewhere else. I like to put the nest box directly in front of the cage door, pushed to the back of the cage, which is convenient for me. If this location covers the doe’s ‘toilet,’ I can simply move the nest box away from the cage wire a bit toward the center of the cage. I still have access to the nest box, and the doe doesn't have to change her habits. If you put the nest box in the cage too soon, the doe might take a liking to just sitting in it, and then foul it without thinking. At 28 days, her instincts for keeping the nest box a nest box are stronger. 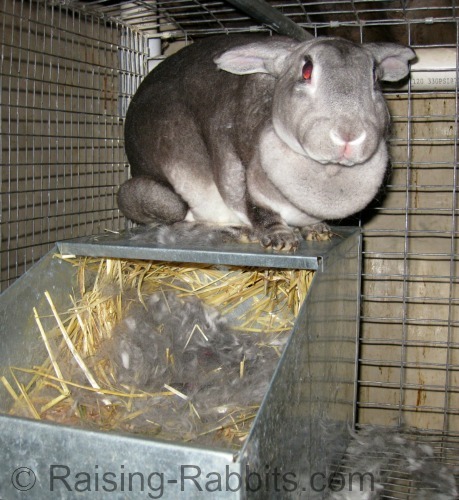 Go to our Rabbit Nest Box page for information about preparing the rabbit’s nest box. Is the rabbit giving birth?? Yep! This is the BIG DAY you've been waiting for ever since the rabbit breeding! On Day 31, you’ll become the proud owner of up to 15 newborn kits! This is the day that feels like Christmas! But, if you bred your doe in the evening, the chance is great that the doe will kindle on the night of day 31, and you will find the kits in the morning of day 32. 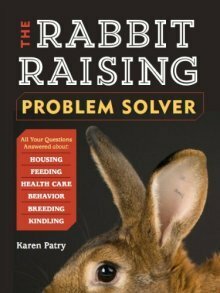 But, that’s the topic of Rabbits Giving Birth - Click here.